Spring means layering clothes. 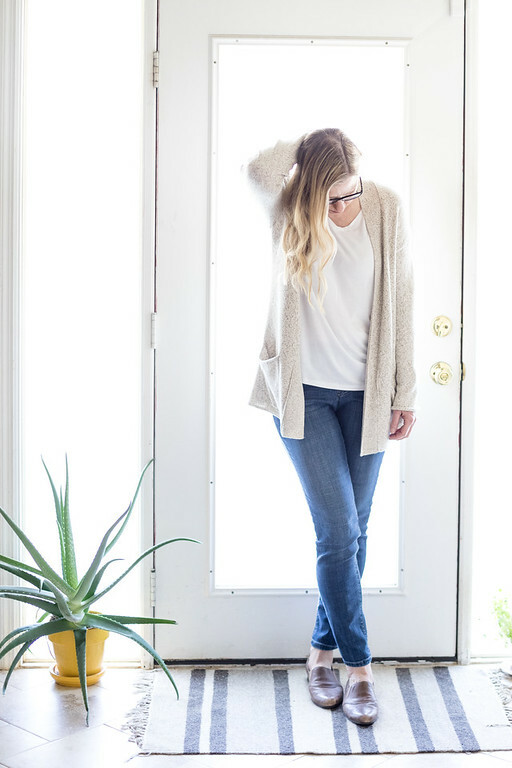 Having layering cardigans, especially Cotton Spring Cardigans in a Spring Capsule Wardrobe makes dressing so easy! Another Spring Capsule Wardrobe Essential is a cotton cardigan for layering. Cotton helps it feel lighter, while still keeping you warm. My favorite is a heather blend of white and taupe, like this one from J. Jill. It’s lighter color makes it perfect for spring. Also, try not to be distracted by the aloe plant that is trying to take over our home! I look for a nice medium weight cardigan. A light neutral color allows it to go with everything. I also love a longer shape and pockets are a must. Some similar cardigans: Cotton Blend Soft Blush Color, 100% Cotton Cardigan Lots of Colors, Cotton Blend Blush. 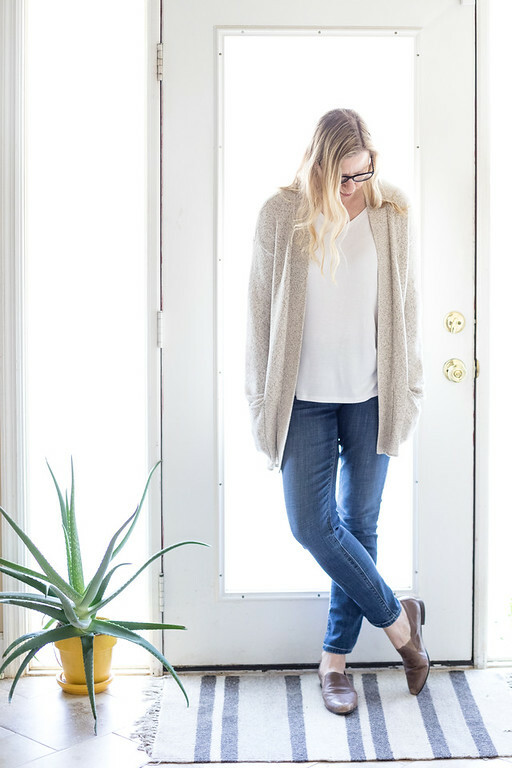 I paired my cardigan with Lee Modern Fit Dream Jeans and my favorite Taupe loafers (Similar.) This outfit fits my style so well. Minimalist and clean. Loosely based on the French Minimalist Capsule Wardrobe from Classy Yet Trendy. Cute outfit! 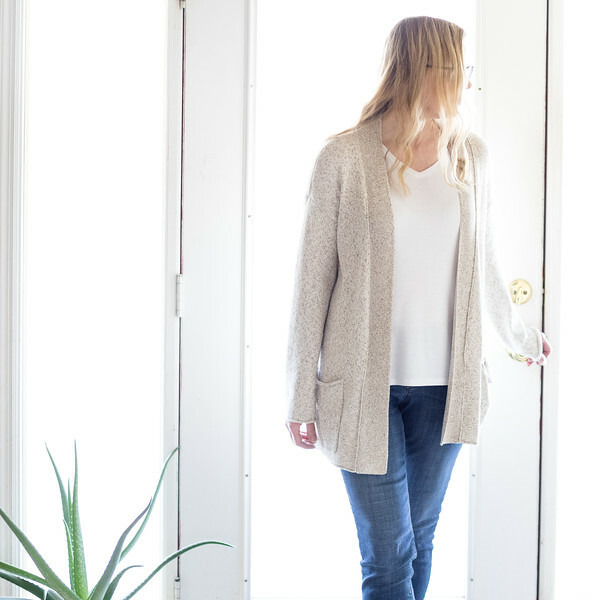 I like the neutral color of your cardigan and layers are a must during this time of year when Mother Nature is playing us with the high and low temperatures! Yes, this spring has been crazy! Love this simple but classic outfit. I love the cut of those jeans! They are so flattering! The cardigan also looks like it would be perfect for spring too! I love the sweater and it looks so neat and put together with jean. I also love J. Jill. I was there last week and spent too much. I’m going to check out those jeans because I love a good pull on pair…thanks Pam for sharing. That is pretty and goes with everything.